Absheron peninsula tour, visiting Ateshgah temple – This territory is known for such unique natural phenomenon as burning natural gas outlets (underground gas coming onto surface contacts oxygen and lights up). The temple in its present state was constructed in the 17th-18th centuriesand Yanardag- One of the most famous and popular tourist places of the “eternal flame” in Azerbaijan is the mountain of Yanar Dag. Heydar Aliyev Center is considered as is one of the main attractions for tourists and has also become a symbol of modern Azerbaijan and modern Baku. Baku “Venice” is one of the most beautiful and favorite places of recreation of residents and guests of the capital. Baku “Venice” is a small town on the water and is one of the jewels of Azerbaijan’s capital. 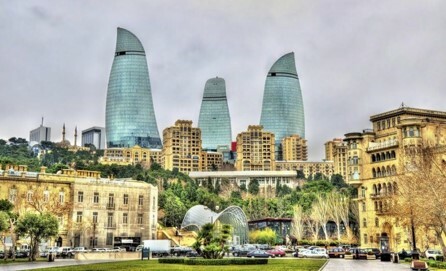 Old City or Inner City is the historical core of Baku, the capital of Azerbaijan. The Old City is the most ancient part of Baku,which is surrounded by walls were well protected. In 2007, the Old City had a population of about 3000 people. Trip to the Mud Volcanoes According to the number of mud volcanoes Azerbaijan takes first place in the world. Approximately 350 of 800 existing mud volcanoes are found in Azerbaijan. Most of them are concentrated in Gobustan Region. Active Mud Volcanoes of Dashgil Group There is a group of active volcanoes Dashgil situated to the east of the Gobustan museum. You will be able to see it very close and climb to the very crater of mud volcanoes and watch the gurgling liquid clay. Uplistsikhe built on a high rocky left bank of the Mtkvari River, it contains various structures dating from the Early Iron Age to the Late Middle Ages, and is notable for the unique combination of various styles of rock-cut cultures from Anatolia and Iran, as well as the co-existence of pagan and Christian architecture. The Monastery of St. Nino at Bodbe is a Georgian Orthodox monastic complex Originally built in the 9th century, it has been significantly remodeled, especially in the 17th century. The monastery now functions as a nunnery and is one of the major pilgrimage sites in Georgia, due to its association with St. Nino, the 4th-century female evangelist of Georgians, whose relics are shrined there. 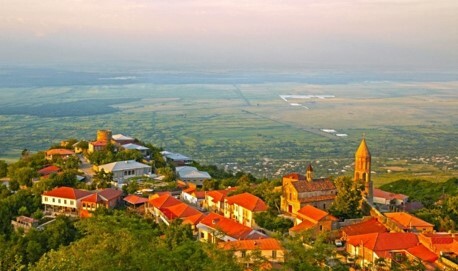 Sighnaghi is endowed with significant historic and cultural heritage sites. 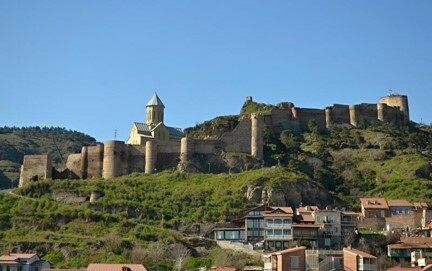 Its charming cobblestone streets and alleys, restored original nouveau woodwork, and detailed facades give the town a romantic mystique.The town sits atop a bluff overlooking the Alazani Valley, which is one of Georgia’s most famous wine-producing regions. Stunning view of the Alazani Valley make Sighnaghi one of Georgia’s most attractive small towns. Tsinandali is Kakhetian residence of the 19th century Prince, poet and public figure, Alexandre Chavchavadze. Chavchavadze inherited village Tsinandali from his father, Prince Garsevan. In 1835 he renovated the estate, built a new palace and a decorative garden. Here, Chavchavadze frequently entertained foreign guests with music, wit, and – most especially – the fine vintages made at his estate winery (marani). Prince was familiar with European ways of wine-making and constructed Georgia’s oldest and largest winery where he combined European and centuries-long Georgian winemaking traditions. The highly regarded dry white Tsinandali is still produced there. The exhibits of Tsinandali museum recreate scenes from intellectual life of 18th-19th cc. It also includes a beautiful garden and also the wine cellar, where unique collection of wine are kept (20000 bottles).